This foster parent also attended the party. It was a party! Last Friday evening in some glorious, breezy weather I attended a “release party”. There was wine and cheese, lawn chairs and about thirty guests. But the guests of honor weighed about three pounds and sported feathers and fearsome talons. Last Winter as they have for the past several years, a pair of Great Horned Owls nested in a horse barn which I frequent. They chose a rafter for the “nest” (GHOs make rather rudimentary nests, more a small pile of rough sticks), laid eggs and hatched out two chicks. All was well for a couple of weeks. Then through mishap, the mother bird was disturbed from her nest and wouldn’t come back inside. After a couple of days, a brave volunteer at the barn climbed up and plucked the resistant, hissing babies off the beam. The babies at this point were all eyes and ferocious feet, the size of a softball because of their covering of white, fluffy feathers, but only weighed a few ounces. 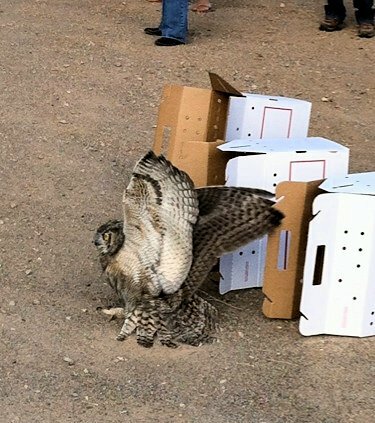 They were bundled off to the Santa Fe Raptor Center, one of Santa Fe’s many wonderful a non-profit organizations which benefit wildlife. See more about them below! Raptor Center volunteers immediately offered the babies a meal of dead mice (yum!) of which they each ate half a dozen. Since growing babies need lots of calcium for growing those strong bones, prey including bones is given whenever possible. “Our” babies were placed with an adult foster bird. 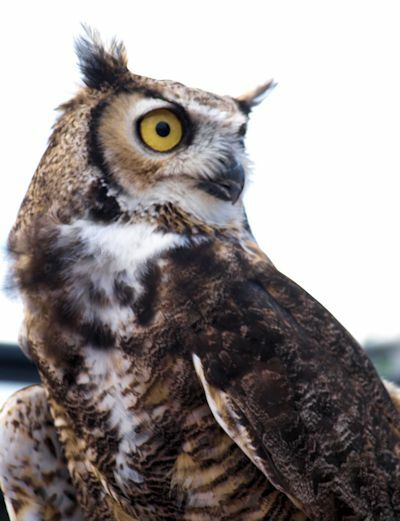 The Raptor Center has several birds of various species which due to permanent injuries are unable to be released. Some of these are great foster parents, however. While they don’t necessarily take on feeding duties, these foster parents model correct wild bird behavior at a time in the owlets’ lives when they are rapidly soaking up what it means to be an owl, including how to hunt. Human contact must be minimized so the birds stay wild. Fast forward four months and many meals later; time for release! This year, the wonderful volunteers from the Raptor Center have begun inviting the rescuers to join in sharing the triumph of successful releases. Of course, our little barn community may have taken that a bit far with the tailgate party of champagne, fancy finger foods, custom cake, astroturf lawn and lawn chairs but it was a very happy occasion. 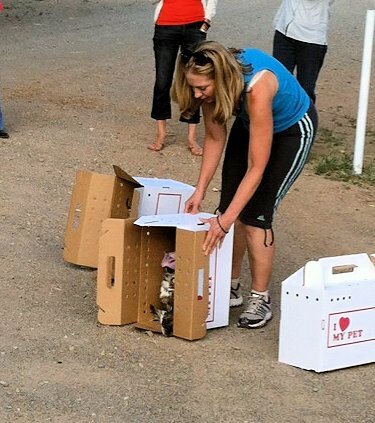 The birds arrived in cardboard pet transport boxes which were set up a little ways away from the eager spectators in an open area with trees nearby. We didn’t want to be too close to our barn buildings but still in the original neighborhood. In addition to “our” two females, a young male bird would tag along. Time to leave the box. One after the other, the boxes were carefully opened by SFRC director Lori Paras and unceremoniously tipped over. A little more nudging was required in each case to encourage the now fully feathered young birds. And up they flew! They now face the real world, of course, but may they have wonderful lives! 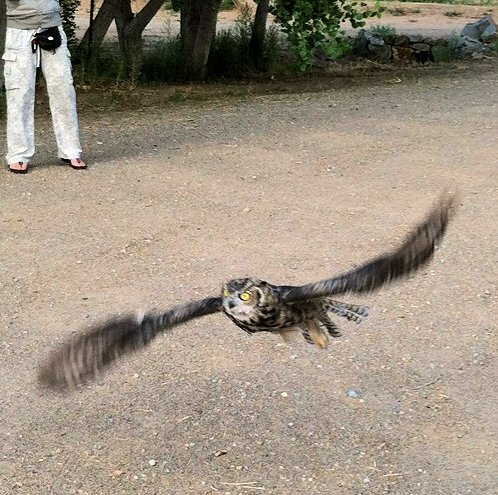 This entry was posted in Critters, Current news&events, Flowers&Fauna, Human interaction and tagged Birds, education, nature, New Mexico, outdoors, Owls, raptor, rehabilitation, wildlife. Bookmark the permalink.